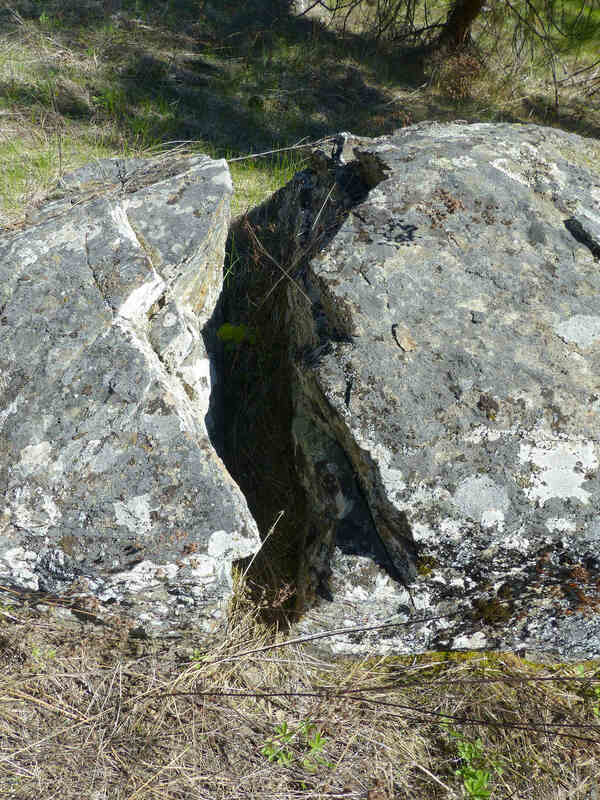 Wherever there is a crack, stuff grows in the Okanagan. That crack above has yellow clover and feral grasses, but there are cracks, right on the sidewalk beside the main highway through town, which are growing wireweed, purslane, amaranth, wild lettuce and plantain, which is to say four food crops and one medicinal plant great against mosquito bites. As for downtown Kelowna, the Okanagan’s urban knot, have a look at this wild lettuce, growing behind a downtown restaurant. in what appears a total desert, life is flourishing. In other words, the Okanagan is neither a desert nor dry. Look at how a simple roadway can be a seasonal river. That water could have been easily diverted at that joint, and used to grow the thistles I mentioned yesterday, or sunflowers, for a bird seed industry, or anything you like. The land is simply not dry. Only the air is, and not always. Here’s that alley again. Note the tree on the right, and the water pouring out of a roof drain, uselessly onto asphalt. Rocks like that are everywhere in this region, split by winter frost and spring thaw. They collect water. Not only that, they collect bird droppings, which contain saskatoon seeds, which bloom and give fruit. The image below shows a very common local sight. …and collects water and manure (from birds and marmots) and nutrients (from crumbling rock) to nurture the plant, despite the ongoing lack of free-flowing water. The trick in this climate is not to get water to flow but to get it to stop as soon as possible. This principle can be applied throughout the valley, for landscaping projects and even for creating farming land where no water is otherwise available. And we’re close. Look at the decorative rocks in the landscaping above. They are visually appealing (perhaps) and collect heat. They could have been arranged to collect water as well. We’re close on this one. Let’s take that one extra step. Well, I hope it helps. I hope I’m not just talking to myself. And you, it seems. Yay! Harold … it is so encouraging to see this project. As I read nature-related blogs I see more and more posts about loss of wild land, special places, species. While this documentation serves a purpose it doesn’t get us beyond the sense of sadness at these losses. That isn’t enough. Your project will help get us all thinking about what we might do in our corners of this amazing world. Is it possible do you think to somehow link bloggers on a bigger scale? Perhaps as a source for ideas and resources? Right now we are scattered and less effective that we might be if we somehow could join efforts. Nothing at the moment. Just this discomforting sense that more could and should be done … Any response from your readers about ideas ? I’ll follow this with interest.